Now the internet scramble. Where can I get it...also while still sitting on the couch watching Netflix? This scenario plays out weekly for me. I see fabric. I need fabric. Gimme that fabric. 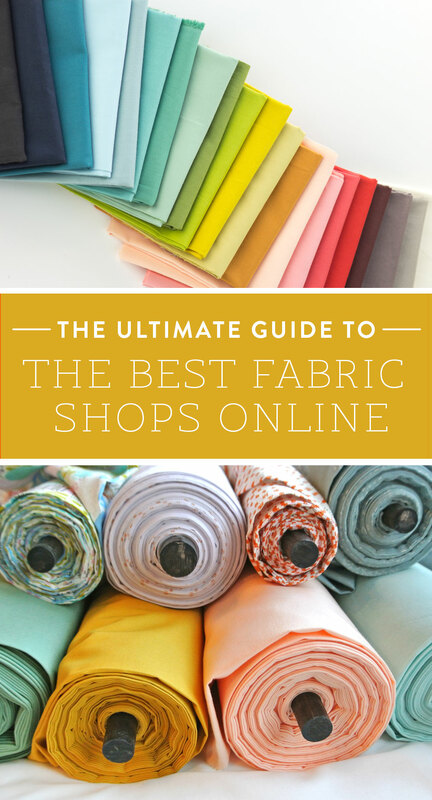 Wouldn’t it be nice if you had a go-to list of online fabric shops? With ready access to online inventory, you drool over a swatch and within 10 minutes, you find it and order a yard...or two or three! A lot of the smaller shops started with a love of sewing and grew into a passion for entrepreneurship and customer service. Because some of these shops are small and even run out of the owner’s homes, they can be hard to find with a quick Google search – which is a real bummer because it gives me such a warm fuzzy feeling to support small fabric shops. Bloomerie Fabrics is like your local fabric shop – only exclusively online. The personalized customer service, modern fabric selections in a variety of substrates, custom Bloomerie Bundles, individual fat quarters, and free samples with orders are just a few of the things customers love about this store. Clair's Fabrics is an online shop specializing in all things modern. Clair always looks for the cheapest, fastest way to ship orders and will make part refunds if she can send an order for less than what was originally charged. After attentive customer service the number one priority here is to have fun! Three words. Liberty of London. This website has a vast selection of your fav Liberty prints in a variety of colors and cuts. After visiting this online shop you will be dreaming of tiny prints for days. Liberty Clubs are also available so you don't miss a new collection. 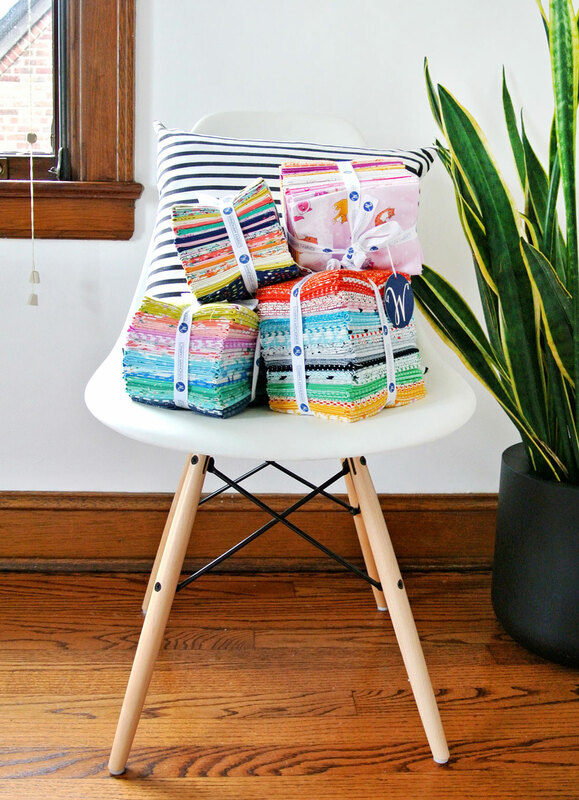 Fabric Bubb is a family run shop that specializes in selecting the best modern, geometric and on-trend fabrics. They carry the latest designer fabrics, Japanese import prints, all the KONA solids and curate specialized bundles that have become incredibly popular with customers. Kristina and Evan take pride in accurately processing and shipping orders at lightning fast speed. Fabric Spark is where you'll find fabrics that inspire you and get your sewist imagination traveling. This shop chooses prints, colors and substrates based on design quality, originality, usefulness and how much joy they bring to fabric loving hearts. In every fabric listing Fabric Spark shares why they chose it, what they like about it, and what they'd make with it. Fabric Spark also tries to find the little gems and lesser known goodies that might not be available everywhere but still deserve a spotlight. Fabricworm is the perfect one-stop shop for the newest collections of modern fabric, fabric bundles and kits. (FYI, you can get kits for a few of my quilt patterns including: Retro Plaid, Mod Melons and Warrior) In addition to the store’s wide range of designer fabric, Fabricworm also carries a large selection of organic cotton. With a wide breath of apparel, quilting and home decor fabrics as well as a user friendly website, Hawthorne Threads endeavors to inspire the modern sewer. The shop owners, Charlie and Lindsey, continue to stretch artistic bounds by expanding into an exclusive line of in house designed and printed collections. Kate started this store because she was unable to locally source the brighter, more modern (and sometimes slightly retro) fabrics she loved. Kate loves meeting with and visiting distributors to choose new fabrics from a range of manufacturers including Moda, Liberty, Free Spirit, Alexander Henry and Art Gallery, as well as some gorgeous, quirky modern Japanese prints from Sevenberry, Cosmo Textiles, Sun Prints and Yuwa. This unique Etsy shop carries a little bit of everything, but specializes in Art Gallery Fabric. If you are looking for an AGF new release, this shop will have it for sure. In addition to yardage, Llama Fabrics sells pre-cut designer bundles with the coordinating solids. Pink Castle Fabrics is the perfect fabric shop for the modern quilter. They stock hundreds of solid fabrics and always have modern blenders and stash builders in stock. Pink Castle has a big selection of beautiful Liberty of London lawn fabrics and super cute imports from Japan. Every week Pink Castle gets new modern collections and they also create fabulous custom bundles. A great way to build your stash is to sign up for one of their monthly clubs! This online shop also puts on the very popular Stitchalot and Sew Pro events. The once Pink Chalk Fabrics is now ilovefabric - new name, same great fabric and patterns for modern sewists. This online store stocks over 500 solids and all of your favorite designer prints. ilovefabric also has one of the most organized websites on the internet. Fabric is listed by color, collection, designer, manufacturer, pre-cut and what's new. Basically anything your quilty brain is thinking, the ilovefabric website will make it incredibly easy for you to find exactly what you are looking for. 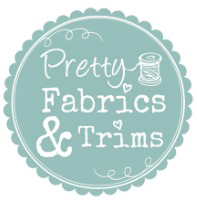 Pretty Fabrics & Trim is a family business passionate about fabric and good old fashioned customer service. This online shop specializes in traditional fabric and notions with a modern twist. Their inventory focuses 1930's reproductions, Tilda and Japanese Imports. If you are looking for chintzy florals, delicate stripes or pretty little prints, this is the shop for you. Purl Soho was founded in 2002 by three women with a passion for exceptional design, natural fibers and crafting tradition. You can see those themes carried through their fabric selections which focus on beautiful linen, shot cotton, Liberty of London tana lawn and select designer fabrics that share a similar "natural" aesthetic. In addition to selling fabric, yarn, patterns and notions, this website boasts some of the most stunning free tutorial projects you will find on the internet. Read more about this shop in the N﻿Y﻿ City Guide! Sisters, Mary and Shawn, bring a joyful sensibility and love of all things kawaii and quilty in the selection of products for Sunny Day Supply. The shop is chock-full of lovely fabrics from leading designers and manufacturers, concentrating on hard to find Japanese lines; gorgeous double gauze, oxford cloth, lawn and quilting weight cotton. The Sunny Day blog is filled with tips and tutorials to inspire. Mary and Shawn wrap all purchases lovingly and creatively, making an order from this online shop a special experience. If you have been happily surprised by a new fabric shop discovery, or if you see one of your long-time favorite stores, tell us about it in the comments section! I'd love to hear what you're buying and making from these great online venues. Awesome list! There are actually a few that I hadn’t come across yet, and I’m excited to investigate them! I am hoping this is only a beginning og a list. There are so many good ones missing, such as Intrepid Thread, Westwood Acres, Stash Fabrics to name a few. I do hope to add to this list, but sadly I can’t fit every great shop in one post. Thanks for the heads up on some more online resources! Country Rose Quilting in Canada is a small online shop with free returns and great shipping! Could we be added to the list? We often direct friends and family to your site! In fact we are all fans of your quilts and patterns. Keep up the amazing work???????? Thanks for sharing some of your top fabric spots Suzy! I was unfamiliar with about half of them, so look forward to checking them out and seeing what they have stocked!!! Some of my go-to places tend to be Fat Quarter Shop and Craftsy as well – they have pretty good sales! Thanks for compiling this list! The internet is a huge place and it’s always daunting to sift through everything. I’m sure there are a ton more great places but there’s always room to add! Looking forward to checking these out. my wallet though, has different thoughts.. The Quilted Castle is a great resource. Always a great selection of sale fabrics too! Awesome resource!! Thanks for taking the time to put it together! Just discovered a bunch of shops I hadn’t heard of until now! Thanks for the awesome list, Suzy! Let the online shopping and fabric hoarding commence!!!! Thank you so much for including me, Suzy. Sending much love your way ???? Missed my favorites!! Sew Lux and Quilter’s Square! Intrepid Thread is my favorite online store. Also I love Del Ray Fabrics. Though the fabric is a bit pricey I love the customizable option at Spoonflower.com. You can shop through other people’s designs or make your own and they print it on your choice of fabric! Wow, what a great list — many new-to-me. I’m so happy to have found you via Instagram. Several of your selections have Liberty of London, but my very favorite shop for Liberty is Thimbleanna’s etsy shop (https://www.etsy.com/shop/Thimbleanna). Her prices are the lowest anywhere — which is great since Liberty of London is so expensive. She has other fun fabrics too! Mad About Patchwork – A wonderful quilting fabric store in Ottawa, ON, Canada. They began as on online fabric store, but now have a storefront with extremely helpful and wonderful staff. They also offer sewing/quilting classes. Wow! 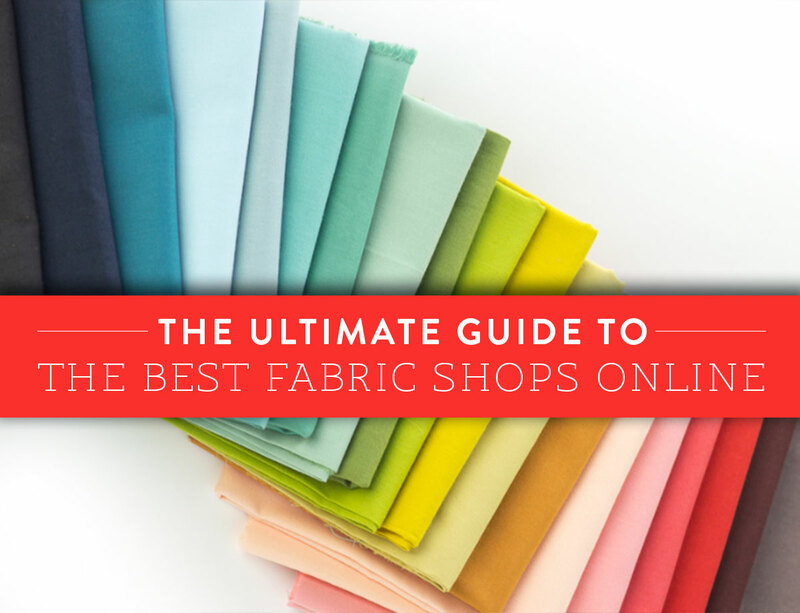 This list gave me so many great places to buy fabric. The only change I would make is adding stash builder box. They have a large variety of fabrics and a great subscription box that delivers fabric and materials to your door step every month. They also do a lot of charity projects with the money they make from each purchase. They use 20% of the money to make quilts and blankets for kids in need. I really think everyone should check out this site and subscribe to their box. Suzy – I wish I had a picture of it, but I recently went to a friends house and they made an outdoor quilt to cover an outdoor couch. It wasn’t really for snuggling up outside but was used as an amazing cover for their outdoor couch. It had amazing colors and she used some amazing die cut shapes to make an amazing art piece. It made me think of you. I asked her where she got her material and she said she got it from http://www.MarineVinylFabric.com. You should consider doing something like this and blogging about it. it was so unique and beautiful. That’s a fabulous idea! Thanks for the inspiration! Do you accept merchandise from the businesses you recommend on your site? It would be helpful if you were transparent on this issue. Any post that is sponsored is clearly marked as a sponsored post. I love http://www.fabricshack.com They have the cheapest Kona solids around ($5.50/yd) and a wide selection of other fabric. They offer half price shipping (so 3.50 for a flat rate Priority envelope). And they’re fast. I’ve ordered many times, and can not recommend them enough. They also have a brick and mortar store in Waynesville OH. Just Go Sew. Raquel has a pop up shop on Instagram @justgosew_popup_shop as well as an Etsy storefront and .com. She has a curated selection (Carolyn Friedlander, various Essex linen lines and some other collections). Her prices are great, and occasionally you can snag great deals in the pop up. Fast and friendly. Etsy in general as well. Lots of great small shops with different selections. Oh, also, Llama fabrics closed up shop, I believe due to an international move. A sad day, they were one of my favorite Etsy stores. KiwiFabric, janum, ModernQuilter are also great Etsy stores. I love Hill Country Cotton! Such great modern fabrics! I really appreciated both 5his article and the one on threads. Thanks so much! ThaNK YOU ! This is such a great list. So many new sites to try. I just moved to a town without a fabric store…. Ugh. So this list is a tremendous help. Thank you. I’m about to ask a question. Are fabrics from China not good? And also where is the best country to get a cotton stretch fabric for making underwear? To the first question, I wouldn’t say that fabrics from China are not good. In fact, probably half the clothing in our wardrobes is from China. A lot of quilting cotton sold in the USA is made in India and Japan. However, I wouldn’t be surprised if big box stores manufactured their fabric in China. As for the second question, I really couldn’t say. Underwear-making is not something I’ve explored. Good luck on your search!